L Brands Inc (NYSE:LB): Are Hedge Funds Right About This Stock? In this article, we are going to discuss the hedge fund sentiment towards L Brands Inc (NYSE:LB). At the end of September, there were 32 funds tracked by Insider Monkey long the stock, up from 29 funds a quarter earlier. At the end of this article we will also compare LB to other stocks including JD.Com Inc (ADR) (NASDAQ:JD), Cummins Inc. (NYSE:CMI), and TELUS Corporation (USA) (NYSE:TU) to get a better sense of its popularity. Now, we’re going to go over the new action surrounding L Brands Inc (NYSE:LB). How have hedgies been trading L Brands Inc (NYSE:LB)? During the third quarter, the number of investors tracked by Insider Monkey long L Brands went up by 10% to 32. 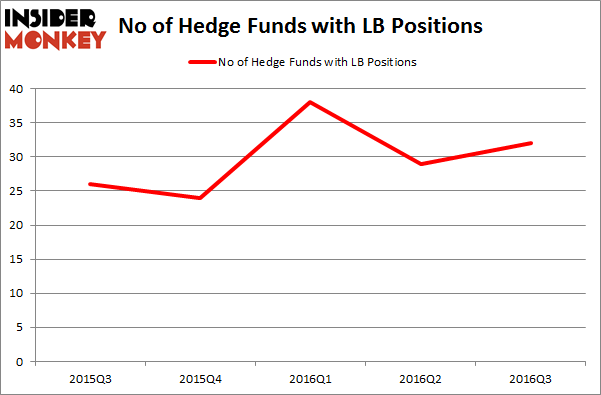 With the smart money’s positions undergoing their usual ebb and flow, there exists a few key hedge fund managers who were boosting their stakes considerably (or already accumulated large positions). According to publicly available hedge fund and institutional investor holdings data compiled by Insider Monkey, Lansdowne Partners, managed by Alex Snow, holds the largest position in L Brands Inc (NYSE:LB). Lansdowne Partners has a $791.4 million position in the stock, comprising 6.8% of its 13F portfolio. Coming in second is Abrams Bison Investments, led by Gavin M. Abrams, holding a $220.1 million position; the fund has 24% of its 13F portfolio invested in the stock. Other professional money managers with similar optimism comprise Murray Stahl’s Horizon Asset Management, John Overdeck and David Siegel’s Two Sigma Advisors, and Phill Gross and Robert Atchinson’s Adage Capital Management.